September 20, 2018 - - As heavy rains move into Oklahoma, AAA is reminding motorists to prepare for dangerous driving conditions. The National Weather Service data shows that nearly half of all flash flood fatalities are vehicle-related. Except for heat-related fatalities, more deaths occur from flooding than any other weather hazard. Do not attempt to cross any standing or moving water that looks more than a few inches deep: It does not take much water to cause a car’s engine to stall, leaving motorists stranded. 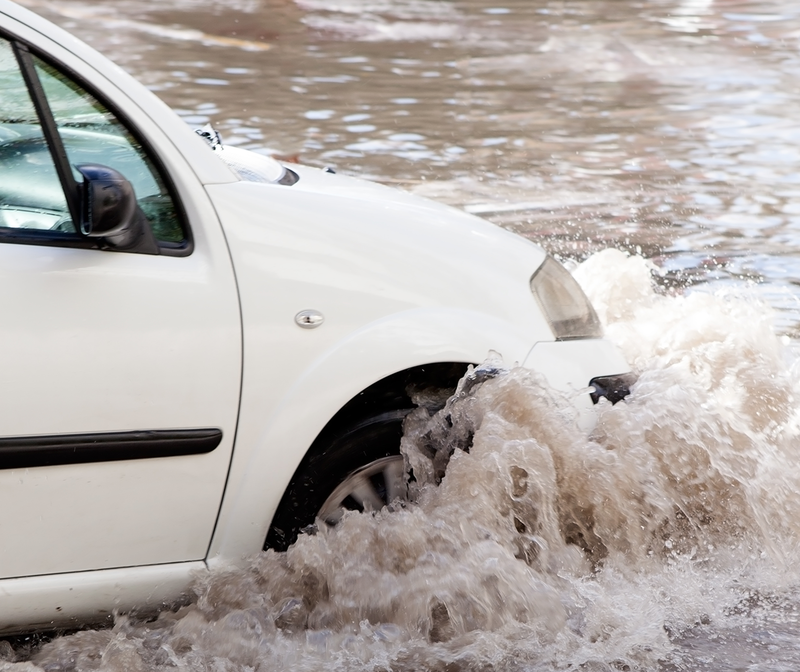 As little as six inches of water on a road can cause drivers to lose control of their vehicles. Avoid Common High Water Areas: Stay away from bridges and roads that are known to flood. If the roadway has been flooded, take a detour – floodwaters can be deceptively strong. Slow down/ Avoid Hydroplaning: Hydroplaning occurs as speed increases and water between the tires and the road builds up to the point that car tires begin to ride on a thin film of water. To reduce chances of hydroplaning, slow down, avoid hard braking or turning sharply and drive in the tracks of the vehicle ahead of you. Don’t be SUV Overconfident: Drivers of four-wheel drive vehicles must remember that they are not immune from hydroplaning on wet surfaces. SUVs are just as likely to lose traction as any other vehicle. Do not use Cruise Control: Avoid using cruise control. This will allow you more options to choose from when responding to a potential loss-of-traction situation, thus maximizing your safety. Be a follower: Driving in the tracks of other vehicles can improve traction and help avoid hydroplaning. Triple following distances: Rain decreases visibility and increases needed stopping distances. Normal dry pavement following distances (2-3 seconds) should be increased to 8 seconds when driving on slippery surfaces. Regaining control in a skid: Effective skid-control maneuvers and a calm approach will help you regain control. If the rear wheels lose traction, look and steer where you want the vehicle to go and do not slam on the brakes. When the rear wheels stop skidding, continue to steer to avoid a rear-wheel skid in the opposite direction. Be prepared. Carry a cell phone and make sure it is charged. AAA members can dial 1-800-AAA-HELP for emergency road service.